Our latest new member to Small Flockers was asked why they joined. Here is the conversation for all the world to see. The names of the innocent have been redacted so as to protect their privacy, and save them from possible retaliation by the Chicken Mafia, the governments, or others. "I received your email confirming receipt of my membership in 'Small Flock Poultry Farmers of Canada'. For your ready reference, I would advise my interest in supporting your endeavors is multi-fold and I suspect too extensive to fully express here at this time. For the sake of brevity, I would advise that my recent research into the food production systems has revealed some startling information which absolutely astounds me. While this organization deals specifically with chickens, the same kinds of frightening practices and regulations seem to infect virtually all sectors of our food production system. In a nutshell, I have decided there is far too much corruption, deceit, unnecessary regulation, protectionism, and excessive costs in the industry. Additionally, the quality of our food is affecting not only my health but that of all people and perhaps all life on the planet. I believe this is the direct result of my assuming that the information previously released to me was sound but it now appears I have been incredibly deceived along with the masses. Consequently, I fully support your efforts to return the rights of individuals to freely engage in the production, processing, sale, and consumption of the food they choose to eat without anyone having to give them such authority other than themselves. Moreover, the responsibility for profit by any producer lies only in their ability to conscientiously provide a valuable product or service to another individual with the freedom to so choose. As far as I am concerned, supply management is no more than an excuse for monopoly and high prices. All free markets have what is called a market clearing price. Poor producers, in any market, are soon removed by the market and that is the only regulation required. Thank you for the opportunity to express these very important opinions." I think that is very well said. SFPFC collects the finest people from all over the world, in this case from a major city in Ontario. For all those interested, here are the redacted version of the email conversation with SFPFC's newest member on their reasons for joining SFPFC.. The above feedback from our members is why SFPFC struggles on, against huge and powerful forces. We will soon be tested at our greatest challenge. We will depend on truth and justice. We hope and pray that the Tribunal will save us from flashy legal trickery, erroneous assumptions, brute force, and monied interests. Hopefully might does not make right. I have been somewhat busy with Spring on the farm, and preparing for the Tribunal. Unfortunately, there hasn't been much time left over for posting on this Blog. The case law research necessary to keep our Appeal alive takes up a considerable amount of time, especially when I'm an pure amateur. So far, I have 11 pages of notes for responding to CFO's Motion to dismiss our appeal. Those note may be all garbage, or may keep us alive; it's hard to know if I'm on the right track. I must file our response by May 2nd, so I have just 7 days left. An email to me that includes your name and address will be sufficient; a signed letter with your name and address is even better. I have had some interesting conversations in the last few days that will hopefully help if we make it past this Motion to Dismiss that has been filed by CFO. There is a lot at stake. I'm feeling the pressure. I'm still hoping that you will send me an email or letter that I can use to support our cause by including it in our response to CFO. If your info and opinion are to be included, plan on sending it to me before the end of April. The use of the powerful antibiotic Ceftiofur in chicks and eggs has finally been banned by Chicken Farmers of Canada ("CFC"). CFC's new rule takes effect on May 15th 2014. CFC's private glacier must have melted a little recently. CFC, long ago frozen in administrative suspended animation, has finally decided to act for the good of Canadians. Previously, it seemed as if CFC would rather focus their efforts on themselves and their millionaire, greedy chicken farmer stakeholders. My heartfelt congratulations to CFC for joining the rest of us who live in the real world, rather than CFC's delusional and self-serving assumptions. Chicken farmers have a long history, over 60 years, of using drugs, chemical, and yes, even poisonous and cancer-causing arsenic in the chicken feed and water supply for their factory farmed foul chickens, This crazy scheme of the Chicken Mafia helps them to maximize their profits and reduce their business risk; regardless of the possible impact on people who would eventually eat their chicken as food. Sounds crazy, but it's true. For ceftiofur, factory chicken farmers ordered the hatcheries to have robots inject ceftiofur into millions of hatching eggs so that the chickens would be tainted before they were born. In other cases, the newly hatched chicks were sexed, then injected with their vile antibiotic fluid so as to maximize their profits and minimize their business risks. 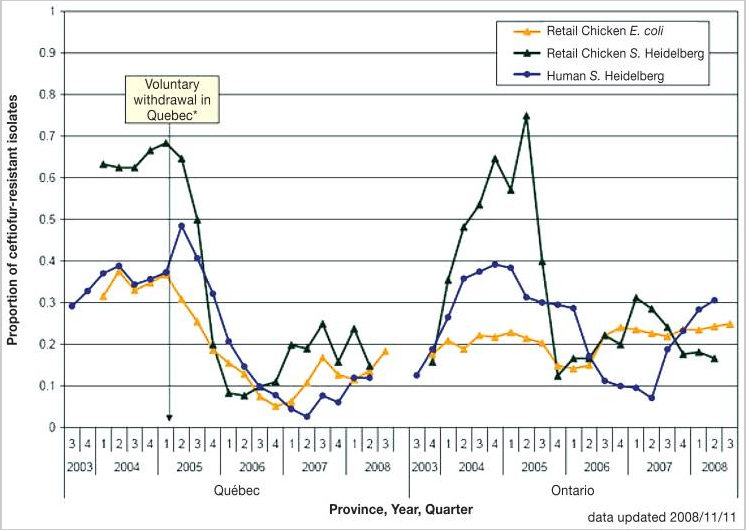 Once Public Health Canada identified the rising tide of superbugs in retail chicken, all broiler chicken hatcheries in Québec voluntarily stopped all use of ceftiofur in February 2005. The superbug incidence rate started dropping shortly after this voluntary ban. The hatcheries ended their voluntary ban, and the superbugs on retail chicken were back soon thereafter. I previously reported on, complained, and warned about these issues as early as March 2, 2013 which is just 3 days after starting this Blog (see Eating Farm Gate Chicken? ). This Blog's all time winning Blog post for reader activity is Choose: Frankenstein Chicken, or Naturally Raised Chicken? from April 2, 2013. Also see here, here, here, here, here, and here. Do you think any of that commentary helped throw CFC over the cliff to abandon their foolish scheme? Is Quebec an isolated case? No, it's Canada-wide. Dr. Nancy de With, DVM MSc, Epidemiologist with BC Ministry of Agriculture and Lands gave a talk on this very subject on April 18, 2006 called "Antibiotic resistance of enteric bacteria in commercial broiler chickens in the Fraser Valley, BC" (original MS Powerpoint slides), or a DocStoc on-line version. Here is Slide 16 which shows up to 96% of the samples of the chicken's intestinal bacteria having SuperBug resistance to Class I (very high importance for humans), II (high importance for humans), or III (medium importance for humans) human antibiotics. and reduce the business risk of millionaire chicken producers, regardless of the cost and risk to the public. Unfortunately, all of these antibiotics, drugs, and chemicals in the feed &/or water fed to factory farmed foul chickens have created superbugs on retail chicken sold in grocery stores. In 2010, Public Health Canada reported an extremely strong linkage (ie. the correlation describes 90% of all variation between ceftiofur-resistant Salmonella enterica serovar Heidelberg isolated from retail raw chicken and incidence of ceftiofur-resistant Salmonella serovar Heidelberg infections in humans across Canada. Most people think of hospitals when they think of exposure to superbugs (ie. nosocomial infections ); some that cause life-long infections, or death. However, today it is likely that the raw chicken in the grocery store is the greater threat, not hospitals. The majority of households do not have repeated visits to the hospitals; most people are generally healthy. However, virtually every family makes a weekly trip to the grocery store. The higher frequency of exposure via the grocery store may make this the #1 risk to your family from Superbugs. You may be a vegetarian, and never go near meat. I hope you don't think that being a vegetarian will protect you from a Superbug infection originating from raw chicken? Most people eat meat, and after they touch packages of raw chicken, they touch just about everything else in the grocery store that vegetarians and everybody else touches too; like the grocery carts, food display cases, and the handles on the freezer cases in the grocery stores. Now that you also touched those same surfaces, that Superbug slime from the chicken wrapper is all over your hands too. You'd better be careful what you touch next. Oops! You touched your lettuce in your cart when you re-adjusted its position so it wouldn't get squished by your other groceries. The lettuce is now contaminated with chicken Superbug ooze, and those Superbugs won't fully wash off even if rinsed under running water at home. Your salad now has an extra, secret ingredient that you did not intend to add. Say thank-you to the Canadian factory farmed foul (chicken). This story was initially broke by Margaret Munro's story in The StarPhoenix and/or O.Canada.com (more comprehensive version). Click the link and read the excellent history that puts the "smoking gun" in the hands of the CFC, while they stand over the dead bodies of their alleged victims, the Canadian public). These stories seems to have been based on a related story in the Ottawa Citizen. chicken, then in humans, so Quebec allowed ceftiofur to start being used again. The superbugs soon came back again, so Quebec banned ceftiofur again. The Canadian Veterinary Journal and Public Health Canada sheds some additional light on the subject here, here, here, here, here and here. Here is the graph showing the Superbug hotspot data from Quebec and Ontario. Searching CFC's website for "ceftiofur" so as to confirm this news flash yields nothing. 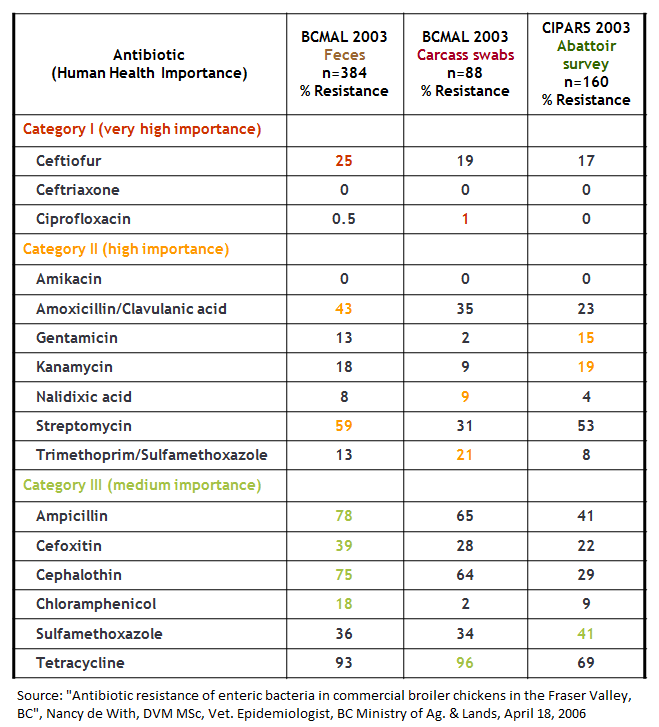 Searching for "antibiotic" gives CFC's standard propaganda justifying their fossilization and suspended animation of their self-serving and wrong headed policy on the permitted and recommended use of antibiotics to maximize chicken farmer profits; in spite of the growing evidence of their wrong-headed policies. After May 15th, it is hoped that CFC and all other SM Mafia personnel will actually audit their henchmen to ensure their compliance with the new rules. The greatest risk of all is some renegade chicken farmers who are greedy enough to continue buying their drug of choice on the black market, or ordering their corporate veterinarian to prescribe the drug of choice, or personally importing it, and feeding it to their flocks; callously continuing the risk for Canadian consumers. US Centre for Disease Control released the following video in Sept. 2013 about antibiotic resistant diseases spreading throughout North America. In the interim, here are SFPFC's recommendations to protect yourself from chicken superbugs in the grocery store and when you bring them home to your unsuspecting, innocent family members. So CFC finally took action on this huge Superbug risk. Why did CFC take this action now? Was it the end consumer's demands for change? Was it CFC's deep empathy and caring for the needs and priorities of these potential victims of CFC's crazy plans? CFC is a narcissistic organization, like the rest of the Chicken Mafia (see Individual and Organizational Narcissism ). Narcissistic organizations tend not to identify and correct their previous errors. I can only assume that behind the scenes, the Chief Vets of the Provinces and Federal Government, and/or Health Canada and Public Health Canada twisted CFC's arm, by saying "Take appropriate action to this threat to public health, or else!". Maybe someday, we will know for sure. Will CFC give Canadians their assurance that they will adequately police their members and ensure Mafia-style compliance with the Chicken Mafia Don's orders against the use of banned antibiotics? If CFC is unwilling or unable to give us that assurance of comprehensive auditing to ensure compliance, then their banning of ceftiofur is a mere smokescreen to distract and mislead Canadians; true to their narcissistic character. Small Flockers want the abuse and oppression against us to stop. CFO thinks everything is perfect just the way it is. That's why CFO is fighting to stop our appeal to Ontario's Ministry of Agriculture Tribunal. Here is a copy of CFO's Motion to Dismiss, attempting to blow our appeal out of the water, preventing the public hearing of these important issues. Guess why CFO wants to avoid the OMAF Tribunal, and keep everything Top Secret? Is CFO embarrassed by their actions and inactions against Small Flockers? To survive CFO's attack through this Motion to Dismiss, I will need lots of help. Send me an email of support, requesting that the Tribunal allow the appeal to happen. Be sure to include your name, City, and Province of residence. We need letters of support from the general public, farmers, and all professionals to tell the Tribunal why the issues raised by Small Flockers are important to you and the rest of Canada, and that justice can only be done by hearing of Small Flocker's appeal by the Tribunal. I will proceed ahead to the Motion Hearing, even if I am the only one there on our side. Whether this plea for relief of the injustice and oppression, and violation of Small Flockers rights goes any further after that, will in part depend on what you and all others do in the next few weeks to help our cause. Remember Edward Snowden and his release of Top Secret NSA info? Today I feel like I've done the same to Chicken Farmers of Ontario. At right is Top Secret info divulged by CFO in their Motion filed with OMAF's Tribunal. I've previously worked with multi-nationals who treated everything as Top Secret so as to protect their technologies and competitive advantage. To me, it seems CFO takes "Top Secret for Everything" way beyond even those corporation's level of arrogance, xenophobia, and paranoia. I'm not sure why CFO released this info, but they did, so here it is for all the world to see. 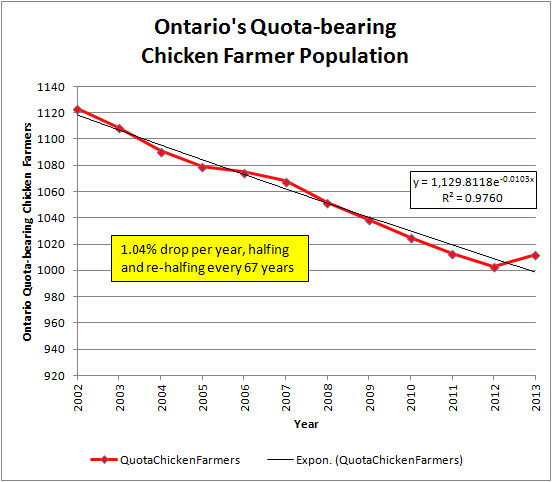 It appears that Ontario's Small Flockers has grown way past our last reported strength of 13,000 quota-exempt chicken farmers. 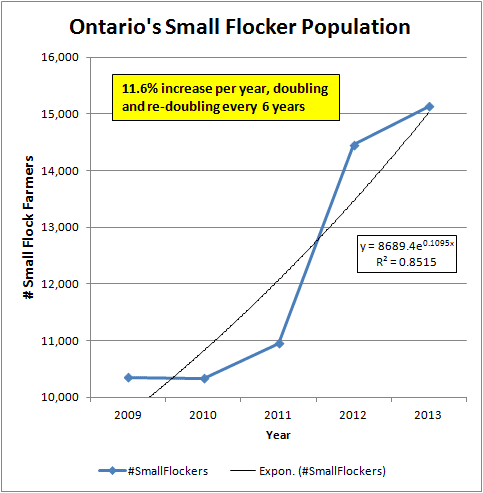 There are now 15,129 Small Flockers in Ontario, increasing at an average rate of 11.6% per year for the last 4 years. How does that compare to CFO's millionaire quota-based chicken farmers? The number of members in CFO's exclusive club have been dropping since 2002. Is this resistance of Small Flockers legitimate complaints jealousy, fear, or spite by CFO and its dwindling members? P.S. Here is a copy of CFO's Motion to Dismiss, attempting to blow our appeal out of the water, preventing the public hearing of these important issues. The Chicken Mafia thinks they're running the show, the Kings of Canadian Chicken. Whatever happened to "The Customer is King"? In health care, a public service paid for by our tax dollars, virtually every Doctor, Nurse, PSW, and Administrator realize that the patients must be provided timely, accurate medical information so that they can make an informed medical decision. Whether the health care provider agrees with the patient's decision, or the patient followed or ignored their expert medical advice, once the patient has made the decision, those health care providers are responsible to enable and facilitate that patient's decision, whether they agree or not. The legislation and regulations of Supply Management created a monopoly for everyone in the Supply Management system. Consumers now have the "privilege" to pay up to 300% for chicken so as to support this artificial monopoly. Shouldn't that give the consumers some rights beyond "take it or leave it"? I posted previously on this Blog about the 7 questions for which I seek answers by the Ministry of Agriculture's Appeal Tribunal (see "Tribunal Time" ). Since then, the list has expanded to 8 questions. 3. Under Section 7.(2). (a) of Farm Products Agency Act and Section 12. (2) of Farm Products Marketing Act, the majority of producers for an agricultural commodity must agree for that commodity to come under Supply Management. The Appellant alleges that the 13,000 Small Flockers in Ontario were never consulted on this question. In spite of this, both the Federal and Ontario governments have approved the 1,400 member minority to enter Supply Management, and approved the minority to pass onerous regulations that favour the minority and oppress the majority. In a free and democratic country, is there sufficient constitutional authority for a 1,400 member minority to be given unilateral authority to rule and control both the 1,400 minority and the 13,000 majority, thereby creating a Chicken Apartheid? The governments of Canada have their powers limited to "peace, order, and good government" according to Section 91 of the Canadian Constitution. Canada is a free and democratic country, as the Supreme Court of Canada likes to keep reminding us. That means that government must work for the greater good of all (the majority, or as close to "all" as we can get), while protecting the rights of the minorities. So how did their lobbyists slip this by everybody so as to construct a Chicken Apartheid where 1,400 chicken farmers rule the roost, and decide on what's best for them, at the expense of the other 13.5 Million people in Ontario? Small Flockers weren't consulted on this choice of Supply Management for Ontario chicken. Why were the rights of the 13,000 majority of chicken farmers violated, contrary to the protections and safeguards in the Acts? Like any good trick by a magician, you can watch him do the trick time and again, but may never figure out how he did it. Fortunately, it's easy to figure out that the end result is just plain wrong. It's like finding out that the magician includes a pick pocketing demonstration in his stage magical act. The pick pocketing magician works the whole crowd, amassing a stolen fortune in watches, rings, and wallets. Unfortunately, this particular magician refuses to return anything to their rightful owners. At what point does the crowd stop applauding the slight of hand, and start demanding to get their property back? You can only let that kleptocracy (ie. a bureaucracy that steals) go on for so long before it's no longer funny. Perhaps a similar moment is soon to arrive in Canada for the Chicken Mafia. It's off to the Tribunal we go! Yesterday, I received the Tribunal's acknowledgement of receipt of our Notice of Appeal from the Ontario Ministry of Agriculture and Food Appeal Tribunal. I agreed to all of their proposed dates, but somehow, the Tribunal scheduled us to different dates. The Motion Hearing is scheduled at Tribunal's offices at 1 Stone Road West, Guelph, Ontario Canada (45 minutes from Toronto ON Canada), beginning at 9:30 a.m. on Wednesday May 14, 2014. This motion is likely a preliminary ploy by Chicken Farmers of Ontario ("CFO") to stop the appeal before it gets started. As CFO sees it, I have no rights whatsoever, and they are the mighty and powerful CFO, and don't appreciate me questioning their actions and authority. If you don't mark this date on your calendar and show up at the appointed time, I will likely be there all by myself, staring into the hungry, snarling, foaming mouths of CFO's lawyers; from 1 to 6 Toronto lawyers who will attempt to rip me apart and feed me to their young; all while being paid $500 per hour for each of these legal wolf-mercenaries. Bring popcorn and your smart phone for live video opportunities. This will likely be interesting. This hearing, and if we ever get to the Tribunal, could cost up to $3,000 per hour that CFO has to pay their lawyers. Of course, CFO will fund the protection of their monopoly by raising CFO chicken levies that are charged to quota-based chicken farmers. Ontario's factory chicken farmers who pay those levies will, in turn, be reimbursed by raising the farm gate chicken prices that the farmers enjoy. Chicken processors will be forced to pay these higher farm gate chicken prices, so the retail price of chicken will eventually be raised accordingly. So again, the consumer gets shafted by trying to seek an end to the previous and ongoing shafting of consumers. My apologies to all Canadians for increasing your pain through higher chicken prices in the short term. Hopefully, there is a rainbow and pot of gold that will eventually be found through this appeal process. What will we be discussing at this motion hearing? CFO likely feels I have no right to appeal, the Tribunal has no authority to hear my complaints, and I have been scandalous, frivolous, vexatious, trivial, my appeal has no merit, it's an abuse of the judicial process, moot, bad faith, have an improper purpose, or discloses no reasonable cause of action, and therefore I lose any right to appeal. Currently, small flock (ie. non-quota) chicken farmers are subject to government authority and powers that have been delegated to, or vested in Chicken Farmers of Ontario (“CFO”). Since these delegated and vested powers imposed on Small Flockers originated from the governments of a free and democratic country, does the Appellant and other Small Flockers have the legal right to membership in CFO, to attend CFO meetings, to receive CFO information, to run for a CFO elected office, and vote in CFO elections so as to have democratic representation at the CFO Board? If the answer to Q #1 is no, then should Small Flockers be exempt from the By-laws, rules, policies, procedures, powers, authority, rulings, invasion of privacy, and threat of enforcement currently planned and practiced by CFO? Are there other responsibilities, duties, and constraints owed by the Defendants (ie. both CFO and OFPMC) for the benefit of the Appellant or others, that irrevocably flow with the government powers that are delegated and vested in the Defendants, above and beyond those expressly enumerated in the Farm Products Marketing Act and Regulations? Under Section 1.01 of the Federal-Provincial Agreement-Chicken 2001, all members of the chicken Supply Management system agreed “to work in the balanced interest of producers, industry stakeholders and consumers”. Have the Defendants breached these duties under this agreement? If yes, does the Appellant, Small Flockers, the consumer, and/or the general public have vested third party rights, either under this agreement or otherwise, that they can use to seek legal redress from the Defendants? Do the Defendants have a duty to be open, transparent, accountable, prudent, and reasonable; and to consider, accommodate, and be responsive to the rights, needs, expectations, complaints, and suggestions from: (a) the Defendant’s respective stakeholders? (b) The Appellant? (c) Small Flockers? (d) the consumer? and (e) the general public? Is there sufficient objective, unbiased evidence to conclude that the Defendants have fully, faithfully, consistently, effectively, and efficiently: (a) developed plans; (b) avoided risks; (c) implemented their express and implied duties in a timely and good faith manner for the greater good of the consumer, the general public and the Defendant’s respective stakeholders; (d) periodically assessed their own performance, promptly took corrective action as needed, and continuously improved their performance? If the answer to Q #6 is no, what duties do the Defendants have to assess their past performance, identify the cause of their inadequate past performance, determine the optimum solutions, take immediate corrective actions, verify and validate that their remedial actions are fully implemented and effective, and ensure their prior poor conduct (as well as all similar potentials) are avoided forevermore?